"Xavier Hernández" redirects here. For the former Major League Baseball player, see Xavier Hernandez (baseball). For other uses, see Xavi (given name). Xavi joined La Masia, the Barcelona youth academy, at age 11, and made his first-team debut against Mallorca in August 1998. In all, he played over 700 matches, a club record, and scored 85 goals. Xavi is the first player in the club's history to play 150 European and Club World Cup matches. Highly regarded for his humble persona and team ethos, Xavi is viewed as being the embodiment of the tiki-taka passing style of play, and is widely considered to be one of the greatest central midfielders of all time. He is also considered by many to be the greatest Spanish player ever. With Spain, Xavi won the FIFA World Youth Championship in 1999, and the Olympic silver medal at the 2000 Olympics. After making his senior team debut in 2000, he was capped 133 times for the Spain national team, and was an influential figure in the team's successes. He played an integral role in Spain's victory at the 2010 World Cup, as well as their wins at both Euro 2008 and Euro 2012. He was named Player of the Tournament by UEFA at Euro 2008, and was named in the UEFA Euro Team of the Tournament in 2008 and 2012. At Euro 2012, with his two assists in the final, Xavi became the first player to register assists in two separate Euro finals, having set up the only goal in the final four years earlier. He had a 91% passing success rate at the 2010 World Cup and was named in the World Cup All-Star Team. After the 2014 World Cup, Xavi announced his retirement from international football. With Barcelona, Xavi won eight La Liga titles and four UEFA Champions League titles. He has won 31 trophies for Barcelona and Spain, a total only surpassed by Andrés Iniesta as the most decorated Spanish player in history. He came third in the 2009 FIFA World Player of the Year, followed by third place for its successor award, the FIFA Ballon d'Or, in 2010 and 2011. In 2011, he was runner up to Lionel Messi for the UEFA Best Player in Europe Award. He has been awarded the IFFHS World's Best Playmaker award for four years: 2008, 2009, 2010, 2011. Xavi has been included in the UEFA Team of the Year for five years (2008, 2009, 2010, 2011, 2012), and has been voted into the FIFA World XI on six occasions: 2008, 2009, 2010, 2011, 2012, 2013. He was awarded the Prince of Asturias Award for Sports in 2012. Born in Terrassa, Barcelona, Catalonia, Xavi is a product of FC Barcelona's La Masia youth system, which he joined at the age of 11. His father, Joaquim, was a former player for Sabadell in the first division. Xavi made his way through the youth and reserve teams and was a key member of Josep Maria Gonzalvo's Barcelona B team that won promotion to the Second Division. Although he was initially inspired by compatriot playmaker Pep Guardiola at Barcelona, as a child Xavi also watched a lot of English football, and looked up to midfielders John Barnes, Paul Gascoigne and Matt Le Tissier. Xavi's progression through the teams earned him a first-team appearance in a Copa Catalunya match against Lleida on 5 May 1998 and he scored his first goal on 18 August 1998 in the Super Cup final against Mallorca. His debut in La Liga came against Valencia on 3 October 1998 in a 3–1 victory for Barcelona. Initially featuring intermittently both for the reserve and senior teams, Xavi scored the only goal in a 1–0 victory over Real Valladolid when Barcelona were in tenth position in the league. Sustained impressive performances meant that he became a key member of Louis van Gaal's title-winning team, finishing his debut season with 26 matches played and being named 1999 La Liga Breakthrough Player of the Year. Xavi became Barcelona's principal playmaker after an injury to Pep Guardiola in the 1999–2000 season. In these years, Barcelona was on the verge of bankruptcy and struggling to keep its place in La Liga's elite. Playing in the midfield, but with a more defensive role, Xavi made 20 assists and scored 7 goals in those two seasons. On 16 March 2002, he scored his first goal in El Clásico against Real Madrid. Xavi was named the vice-captain in the 2004–05 season, in which he helped Barcelona win La Liga and the 2004 Supercopa de España. He was named La Liga Spanish Player of the Year in 2005. 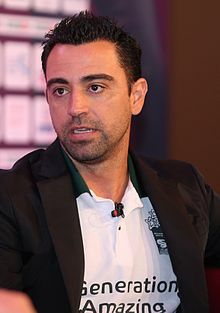 In the 2005–06 season, Xavi tore the ligaments in his left knee in training; he was out of action for four months but returned in April and was on the substitutes bench for Barcelona's win in the 2006 Champions League final against Arsenal. He also won La Liga and the Supercopa de España again. He was a main part of Barcelona's treble and scored the fourth goal in the 4–1 win in the 2009 Copa del Rey Final against Athletic Bilbao, with a free kick. In La Liga, one of his most significant games was the 6–2 Clásico victory over Real Madrid on 2 May; he assisted four goals – once to Carles Puyol, once to Thierry Henry and twice to Lionel Messi. Xavi helped Barcelona win the 2009 Champions League final 2–0 against Manchester United, assisting the second goal by crossing to Messi for his header. Prior to the match, Manchester United coach Sir Alex Ferguson heaped praise on the central midfield combination of Xavi and Andrés Iniesta, stating, "I don't think Xavi and Iniesta have ever given the ball away in their lives. They get you on that carousel and they can leave you dizzy." Xavi was voted "UEFA Champions League best midfielder" for his contribution during Barcelona's victorious 2008–09 Champions League campaign. Xavi was the highest assisting player in La Liga with 20, and in the Champions League, with 7; he earned 29 assists overall that season. Xavi was under contract to Barça until 2014 after extending his contract during the 2008–09 season. The new contract made him one of the club's biggest earners, with a salary of €7.5 million a year. In the 2009–10 season, Xavi again topped the assists table and provided both the assists in Barcelona's 2–0 victory against Real Madrid at the Santiago Bernabéu Stadium. Barcelona won the Liga title with a record 99 points, and Xavi was acclaimed Barcelona's second-best player in a season-long vote. On 3 June 2010, Madrid-based newspaper Marca awarded him third place in the annual Trofeo Alfredo di Stéfano award for the best player in La Liga, behind Lionel Messi and Cristiano Ronaldo. On 9 June 2010, Xavi signed a new four-year contract with the club, which could be automatically renewed up to 30 June 2016 based on number of games played. On 29 November, he scored his third goal against arch-rivals Real Madrid in a 5–0 home win. On 18 December, he scored another goal against Espanyol in a 1–5 win. In the Champions League, Xavi scored a valuable goal with an assist from David Villa in a home win against Arsenal, that saw Barcelona progress to the quarter-finals. Xavi was one of the three finalists for the 2010 FIFA Ballon d'Or, and finished third in the vote behind his Barcelona teammates Lionel Messi and Andrés Iniesta. He narrowly defeated Messi to win the Player of the Year award from World Soccer magazine. On 2 January 2011, in a league match against Levante, Xavi made his 549th appearance for the club in all competitions, matching the record held by Migueli. Xavi later became the player with the most appearances for Barcelona of all time. On 28 May, Xavi was imperious in the 2011 UEFA Champions League Final at Wembley Stadium in London as Barcelona defeated Manchester United in the showpiece for the second time in three seasons, winning 3–1. Xavi began the 2011–12 season in fine goalscoring form and seemed to grow in his influence of the team despite the long-anticipated return of Cesc Fàbregas and the promotion of Thiago to create added competition for places in Barça's attacking midfield positions. On 18 December, in the 2011 FIFA Club World Cup Final in Yokohama, Barcelona won 4–0 against Brazilian side Santos as Xavi scored a goal and made an assist to Lionel Messi. After the ball was slightly behind him, Xavi brought the ball down with a cocked leg, effectively using his ankle to control it, before slipping a pass through to Messi, who scored the first goal. Xavi scored the winning goal in the Group H game against Milan, a vital match for Barcelona's progression in the UEFA Champions League. In total, Xavi had the best goalscoring return of his career in 2011–12 season with ten Liga goals, two in the Copa del Rey – which Barcelona won – and one in the Club World Cup final win. On 18 December 2012, Barcelona renewed Xavi’s contract, extending it until 30 June 2016. He scored a goal against Real Madrid in a 3–2 win for Barcelona. Xavi was named in the FIFA World XI, along with teammates Iniesta, Messi and Dani Alves. Barcelona had virtually secured their La Liga title by the start of 2013, eventually equalling Real Madrid's 100-point record of the previous season. On 16 January 2014, Xavi made his 700th appearance for the first team against Getafe in the Copa del Rey. For the first time in five years, Barcelona ended the season without a major trophy; they were defeated in the Copa del Rey final by Real Madrid with Gareth Bale scoring a late winner, and lost the league in the last game to Atlético Madrid. In June 2014, it was announced that Xavi would be leaving the club. On 22 July, however, after talks with newly appointed manager and former teammate Luis Enrique, Xavi decided to stay at Camp Nou for one more season. He was also appointed as club captain. On 25 April 2015, Xavi made his 500th La Liga appearance, becoming the eighth player in history to do so. On 4 June, a farewell event was held at Barcelona for Xavi with players, managers, friends and family paying tribute to him. On 6 June 2015, Xavi came on as a 78th-minute substitute for Andrés Iniesta to make his final appearance for Barcelona during the Champions League final, as the club won its fifth European Cup, beating Juventus at Berlin's Olympiastadion. Xavi, as club captain, lifted the trophy. This made Barcelona the first club in history to win the treble of domestic league, domestic cup and European Cup twice. Xavi, Iniesta, Messi, Gerard Piqué, Pedro, Sergio Busquets and Dani Alves were part of both treble-winning teams. Xavi playing for Al Sadd against Persepolis in April 2018. On 21 May 2015, Xavi announced that he would join Qatari club Al Sadd at the end of the 2014–15 season on a three-year contract. According to his agent, the deal would involve him becoming an ambassador for the 2022 FIFA World Cup in the country, and also start his coaching qualifications. He made his debut for Al-Sadd in a 4–0 win over Mesaimeer on 13 September 2015, assisting in the team's first goal. In the following match, he scored his first goal for the club in a 2–2 draw with Umm Salal. Al Sadd ended the league campaign in third position putting them in a place for the next season's AFC Champions League. Xavi scored three goals during the season. In the Champions League, Al Sadd were knocked out from the qualifying rounds by Emirati side Al Jazira on penalties; Xavi missed his spot kick. Xavi won his first trophy with Al Sadd following a 2–1 victory over El Jaish in the Qatar Cup final on 29 April 2017. 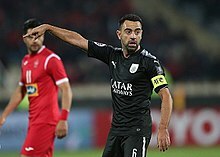 On 10 November 2017, Xavi said that he would retire when his contract with Al Sadd expired at the end of the 2017–18 season, and would later pursue a coaching career. However, he postponed these plans and signed a two-year contract extension on 24 May 2018. Xavi played for Spain at the 2000 Olympics, 2002 World Cup, Euro 2004, 2006 World Cup, Euro 2008, 2009 Confederations Cup, 2010 World Cup, Euro 2012, 2013 Confederations Cup and the 2014 World Cup. Xavi was named Euro 2008's player of the tournament after Spain defeated Germany 1–0 in the final. Xavi was dominant in midfield, where his passing and reading of the game was pivotal to Spain's success, in addition to making tackles, shaping attacks and driving Spain to their first silverware since the 1964 European Championship. Andy Roxburgh, head of UEFA's Technical Committee, said, "We have chosen Xavi because he epitomizes the Spanish style of play. He was influential in the whole possession, passing and penetrating kind of game that Spain played." Xavi scored the first goal in the semi-final against Russia, which Spain won 3–0. In the final, he made the pass from which Fernando Torres scored the winning goal. Xavi at the 2010 FIFA World Cup. Xavi was named in Spain's squad for the 2010 World Cup in South Africa, with Spain eventually winning their first World Cup. He provided the most number of accurate passes, 599 with a passing success rate of 91%, and he crossed the ball inside the 18-yard box more than any other player in the tournament. In the final he made 57 accurate forward half passes. Xavi also covered 80.20 kilometres throughout the competitions, averaging approximately 11.5 kilometres per game. In the final, he covered a distance of almost 15 kilometres. Xavi is the beating heart of this Spanish team, the man dictating the tiki-taka pulse of pass after pass. He may be just 5ft 7in with a curiously hunched gait but no player more influences the way his whole team plays. He doesn't score, doesn't really tackle: he just passes and passes with a precision and wit unmatched by any of his peers. —  Duncan White of The Telegraph on Xavi at the 2010 World Cup. During the round of 16 match against Portugal, Xavi provided a backheel pass in the 63rd minute to David Villa. Although Villa had his shot with his left foot blocked by goalkeeper Eduardo, he then put in the rebound with his right foot for the winning goal. In the semi-final against Germany, Xavi crossed from a corner to the edge of the six-yard box, where Carles Puyol scored with a header into the top-right corner. 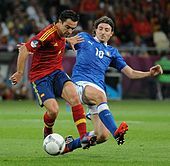 Xavi played for Spain at Euro 2012 which Spain won by defeating Italy 4–0 in the final. Xavi attempted 136 passes (127 completed, 94% success rate) during Spain's 4–0 victory in the group stage match against the Republic of Ireland, more than any other player in a European Championship match. The previous record of 117 had been set by Ronald Koeman in a Euro 1992 match between the Netherlands and Denmark. Xavi and Andrés Iniesta made 229 passes in the match, more than the combined Irish team managed. "Pum, pum, pum, pum" was how Xavi described the rhythmic sound of the ball moving between himself and his midfield partner. 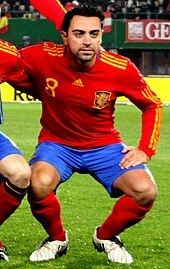 With Xavi providing two assists in the final, for Jordi Alba and Fernando Torres, he became the first player to register assists in two European Championship finals. Spain's UEFA Euro 2012 victory made Xavi the most decorated player in Spanish football history, a status that he previously shared with Carles Puyol, who missed the tournament. On 5 August 2014, following the 2014 World Cup where Spain were eliminated at the group stage, Xavi announced his retirement from international football, having made 133 appearances in a 14-year period. Spain's World Cup-winning manager Vicente del Bosque paid tribute, stating that Xavi was "a key part of the team's style of play" and "he was more important to us than even the manager", also adding, "We will miss him both on and off the pitch. He is a player who we hold in great esteem both personally and as a player. He is and always will be a person and a player who is greatly valued by the federation, the coaching staff and by myself." The claim that Xavi is one of the best central midfielders of all-time relies largely on his ability to find and exploit space as a playmaker. As he said, "That's what I do: look for spaces. All day. I'm always looking." Finding space, he would appear for a teammate to receive and then move the ball on, with his coach Pep Guardiola putting it. "I get the ball, I give the ball, I get the ball, I give the ball." Xavi’s signature move when in possession is performing a 360 degree turn, known as la pelopina, that allowed him to move away from the opposing player, giving him space and time to think about his next pass. Xavi's vision, pinpoint accurate passing and world-class ball control allowed him to dictate the flow of play while rarely relinquishing possession, most notably displayed during Spain's 2010 World Cup victory where he had a 91% passing success rate for the tournament. His ability to control some matches has earned him the sobriquet, "The Puppet Master". A style introduced to the club by former coach Johan Cruyff, Barcelona president Sandro Rosell believed Xavi, together with Lionel Messi, Andrés Iniesta and Sergio Busquets, perfected the club's tiki-taka style of play. Xavi has a sponsorship deal with German sportswear and equipment supplier Adidas and has appeared in Adidas commercials alongside Lionel Messi, Luis Suárez and Robin van Persie. Xavi features in EA Sports' FIFA video game series, and was the top passer in FIFA 15 with a 91 rating. In November 2014, Xavi appeared in FIFA's "11 against Ebola" campaign with a selection of top football players from around the world, including Cristiano Ronaldo, Neymar, Gareth Bale and Didier Drogba. Under the slogan "Together, we can beat Ebola", FIFA's campaign was done in conjunction with the Confederation of African Football (CAF) and health experts, with the players holding up 11 messages to raise awareness of the disease and ways to combat it. Scores and results list Spain's goal tally first, score column indicates score after each Xavi goal. ^ "FIFA World Cup South Africa 2010: List of Players" (PDF). Fédération Internationale de Football Association (FIFA). 4 June 2010. p. 29. Retrieved 13 September 2013. ^ "Xavi, 150 international games with Barça". FC Barcelona. 23 October 2012. Retrieved 11 March 2015. ^ a b "Is Barcelona star Xavi the best centre midfielder of all time?". Goal.com. 30 November 2010. Retrieved 19 January 2014. ^ a b "CL Special: Xavi – The Best Centre Midfielder In The World, The Symbol Of Pure Football". Goal.com. 28 May 2009. Retrieved 19 January 2014. ^ "Xavi Bio, Stats, News – Football". ESPN. 25 January 1980. Retrieved 19 January 2014. ^ a b "Xavi emerges as EURO's top man". UEFA. 30 June 2008. Archived from the original on 1 May 2009. Retrieved 20 April 2009. ^ a b c "Casillas, Torres & Xavi amongst record-breakers for Spain". Goal.com. 1 July 2012. Retrieved 2 July 2012. ^ "Spain midfielder Xavi announces his retirement from international football". ^ "Xavi – a record title winner". FC Barcelona. 7 July 2012. Retrieved 11 March 2015. ^ "Overview: Xavi (25) becomes the Spanish player with most official trophies ever". News-football.net. 30 August 2013. Archived from the original on 13 January 2014. Retrieved 19 January 2014. ^ "Xavi – Xavier Hernández Creus". FC Barcelona. Archived from the original on 28 February 2015. Retrieved 11 March 2015. ^ Jordi Quixano, El País (4 June 2012). "Euro 2012: Spain – the secrets behind the players". London: theguardian.com. Retrieved 19 January 2014. ^ a b "Barcelona playmaker Xavi on Gascoigne, Barnes and Le Tissier". BBC Sport. 14 November 2014. Retrieved 16 November 2014. ^ "barça,partidos 1997/98". Webdelcule.com. Retrieved 16 March 2016. ^ "Xavi's 10 Greatest Moments at Barcelona". Bleacher Report. 12 June 2018. ^ Kent, David (16 January 2014). "Pep talked me OUT of joining Bayern, says Barcelona midfield star Xavi". Daily Mail. Retrieved 22 May 2014. ^ "UEFA Club Football Awards". UEFA.com. 1 May 2011. Retrieved 19 January 2014. ^ "Spanish La Liga Assists Leaders – 2008–09". Espn Fc. 31 May 2009. Retrieved 19 January 2014. ^ "Barcelona Star Lionel Messi Wins The Trofeo Alfredo Di Stefano". Goal.com. 3 June 2010. Retrieved 15 June 2010. ^ Lowe, Sid (11 February 2011). "I'm a romantic, says Xavi, heartbeat of Barcelona and Spain". The Guardian. Retrieved 12 June 2014. Xavi Hernández: "Our model was imposed by [Johan] Cruyff; it's an Ajax model. It's all about rondos [piggy in the middle]. Rondo, rondo, rondo." ^ "Xavi extends deal until 2016". FC Barcelona. 9 June 2010. Archived from the original on 8 December 2012. Retrieved 27 June 2010. ^ "Lionel Messi, Xavi and Andrés Iniesta shortlisted for Ballon d'Or". The Guardian. London. 6 December 2010. Retrieved 13 December 2010. ^ "Xavi: "I feel privileged"". FC Barcelona. 2 January 2011. Archived from the original on 1 August 2012. Retrieved 2 January 2011. ^ "Barça has renewed the contracts of Carles Puyol, Xavi Hernández and Leo Messi". FC Barcelona Official Website. 18 December 2012. Retrieved 8 January 2013. ^ Lowe, Sid (13 May 2013). "A Sense of Anticlimax but Barcelona Still Deserve Their La Liga Title". The Guardian. Retrieved 9 August 2015. ^ Lowe, Sid (9 March 2013). "Barcelona Face up to Uncomfortable Truths after Alarming Slump in Form". The Guardian. Retrieved 9 August 2015. ^ "Xavi Hernández features in his 700th official match for FC Barcelona". FC Barcelona Official Website. 16 January 2014. Retrieved 16 January 2014. ^ "Barcelona's Lionel Messi: I Had a Lot of Problems during 2013–14 Season". ESPN FC. 19 February 2014. Retrieved 10 August 2015. ^ "Barcelona Name Luis Enrique as New Coach, Lionel Messi Signs New Contract with La Liga Club". ABC News. 21 May 2014. Retrieved 10 August 2015. ^ "Alves confirms Xavi departure". Sportal.com.au. 25 June 2014. Archived from the original on 28 June 2014. Retrieved 26 June 2014. ^ "Alves: It's true, Xavi is leaving Barça". Inside Spanish Football. 25 June 2014. Archived from the original on 27 June 2014. Retrieved 26 June 2014. ^ "Xavi confirms Camp Nou exit". Marca.com » English. 6 June 2014. Retrieved 26 June 2014. ^ "Barcelona convince Xavi to stay". Goal.com. 22 July 2014. Retrieved 23 July 2014. ^ "Xavi makes 500th Liga appearance". FCBarcelona.com. 25 April 2015. Retrieved 25 April 2015. ^ "Champions League: Barcelona's Xavi breaks down in live TV tribute". BBC Sport. 3 June 2015. Retrieved 4 June 2015. ^ "Infographic: Xavi's 150". UEFA.com. 3 June 2015. Retrieved 4 June 2015. ^ "Xavi reduced to tears in emotional farewell event at Barcelona as Andres Iniesta pays tribute to his 'captain, team-mate and friend'". Daily Mail. 3 June 2015. Retrieved 4 June 2015. ^ a b "Barça make history with second treble!". FC Barcelona. 6 June 2015. ^ "Barcelona's Xavi poised to join Qatar side Al Sadd". BBC Sport. 20 May 2015. Retrieved 21 May 2015. ^ Juan Castro (13 September 2015). "Xavi on hand with assist on Qatar debut". MARCA. Retrieved 14 September 2015. ^ Bailey, Ryan. "Xavi first Goal". Bleacher Report. Bleacher Report. Retrieved 14 May 2016. ^ "Xavi wins first trophy with Al Sadd". Goal.com. 30 April 2017. ^ "Xavi: Ex-Barcelona & Spain midfielder to retire at end of season". BBC Sport. 10 November 2017. Retrieved 11 November 2017. ^ "OFFICIAL: Xavi extends stay at Al-Sadd until 2020". Al Sadd Club. 24 May 2018. Retrieved 24 May 2018. ^ "Accurate Forward Half Passes in World Cup Final 2010". FIFA. 23 August 2010. Retrieved 7 January 2011. ^ "Distance". FIFA. 24 August 2010. Archived from the original on 11 December 2010. Retrieved 9 January 2011. ^ "Players Heat Map" (PDF). FIFA. 26 August 2010. Retrieved 12 January 2011. ^ a b "World Cup final: Holland must stop Xavi to stop Spain". The Telegraph. 11 June 2018. ^ "Spain – Portugal". FIFA. 27 August 2010. Archived from the original on 16 January 2011. Retrieved 13 January 2011. ^ "Germany – Spain". FIFA. 28 August 2010. Archived from the original on 12 February 2011. Retrieved 14 January 2011. ^ Hayward, Paul (9 July 2012). "Spain's dynamic duo of Xavi and Andres Iniesta have broken the mould proving size doesn't matter". The Daily Telegraph. London. Retrieved 9 July 2012. ^ Hayward, Ben (5 August 2014). "Xavi retires from international football". Goal.com. Retrieved 11 March 2015. ^ "Xavi Hernandez: Barcelona legend quits Spain duty". BBC Sport. 5 August 2014. Retrieved 11 March 2015. ^ Upal, Sunni (6 August 2014). "Xavi is even more important to Spain's success than me, says Vicente del Bosque". Daily Mail. Retrieved 11 March 2015. ^ Lowe, Sid (10 February 2011). "I'm a romantic, says Xavi, heartbeat of Barcelona and Spain". The Guardian. London. Retrieved 14 December 2011. ^ "Lionel Messi Wins Ballon D'Or For Second Time". Archived from the original on 12 January 2012. ^ "Left Back In The Changing Room: From Cabbage to Parakeet". Leftbackinthechangingroom.blogspot.com. 26 April 2011. Retrieved 19 January 2014. ^ "Rosell unsure over tiki-taka future". Soccerway. Global Sports Media. 10 January 2013. Retrieved 22 May 2014. ^ "FIFA 16: 16 Best Passers On The Game". WhatCulture.com. 11 June 2018. ^ Miguel, Javier (3 January 2016). "Xavi Hernández, padre de una niña llamada Asia". Sport. Retrieved 3 January 2016. ^ "Official site statistics". FC Barcelona. Archived from the original on 25 May 2012. Retrieved 15 June 2010. ^ a b "Xavi matches and goals". RSSSF. Retrieved 10 October 2015. ^ a b "Xavi". Soccerway. Retrieved 13 December 2015. ^ "UEFA Champions League 2008/09 - History - Statistics – UEFA.com". UEFA.com. Retrieved 25 October 2017. ^ "Spaniards dominate Dream Team". fifa.com. 15 July 2010. Retrieved 5 September 2014. ^ "FIFA FIFPro World XI: the reserve teams - FIFPro World Players' Union". FIFPro.org. 15 January 2015. Retrieved 1 October 2017. ^ "Real Orden del Mérito Deportivo 2010" (in Spanish). Csd.gob.es. Retrieved 19 January 2014.